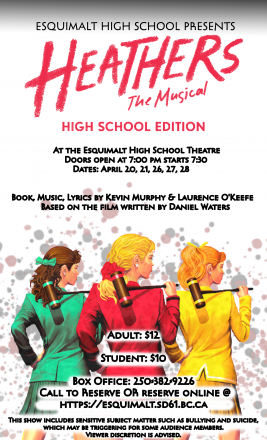 Come see Esquimalt High School’s production of Heathers on April 20, 21, 26, 27, 28. Doors open at 7pm and the show starts at 7:30 pm. The show includes sensitive subject matter such as bullying and suicide which may be triggering for some audience members. Viewer discretion is advised.